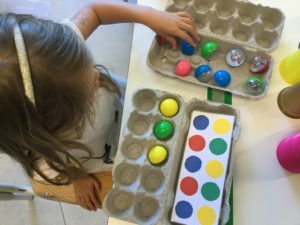 Each child can take an egg box (which he painted with tempera), a basket with coloured balls and a table with the sequence of colours of the code (the colors of the circles correspond to the colours of the balls to be placed in the egg box). 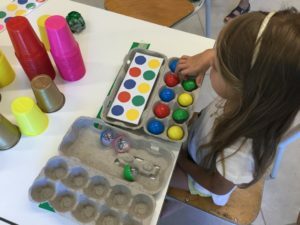 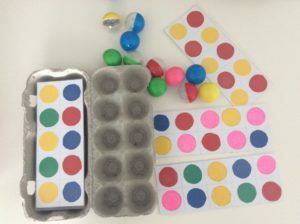 You can start with two colour tables (red-green) and gradually add colours and also make tables with white boxes where the child will not have to put any balls. 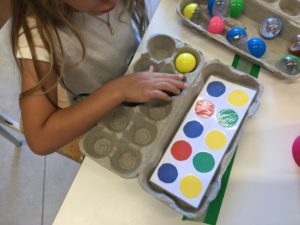 The table can be positioned at the top in the lid of the egg container.